It’s one month into my quest to learn Japanese using Rosetta Stone’s TotalE online solution. Here’s an update on how the system works and how I’ve been getting on with it. I’ve spent 15 to 30 minutes almost every morning working through one or more lessons, as they vary in complexity and duration needed. To my surprise, staying focused has not proven difficult, nor has dedicating the daily time slot. During the week, I set my alarm clock half an hour earlier than it needs to be for work and once I’m showered, dressed and fully awake, hit the “books” before heading to work. On weekends, I’m more relaxed about when I start, but still prefer to learn in the mornings when my concentration is at its best. In one month, I’ve missed only a handful of days, a couple when we’ve been out of town and a couple more when poorly. In that time, I’ve worked through Level 1 Units 1-4 at a fairly steady pace. 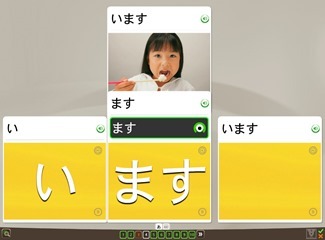 Described by its makers as an immersive way of learning, somewhat like the way children learn their first language, Rosetta Stone is loosely based on Krashen’s Comprehensible Input Hypothesis which postulates that comprehensible input is the key to language learning, that understanding the spoken and written word is far more important than speaking and writing (as far as learning is concerned) and that learning success is heavily dependent on the mood and motivation of the learner. (Note: Krashen himself disputes that the input provided by Rosetta Stone is sufficiently compelling to really fit his hypothesis). Of course, it’s based on far more research than that, and they have invested heavily in research and design to create their unique learning system. So how do the lessons work? Essentially, the lessons are all image based. For each step of a lesson, a number of photographs are displayed. 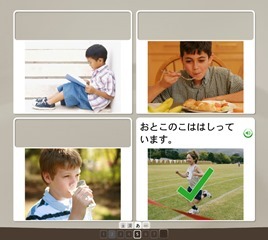 Words or sentences are spoken and the learner picks the matching image to indicate comprehension. Different lessons focus on vocabulary, pronunciation, reading, grammar and writing. The written text of the words and sentences are displayed too, usually after you indicate the answer. 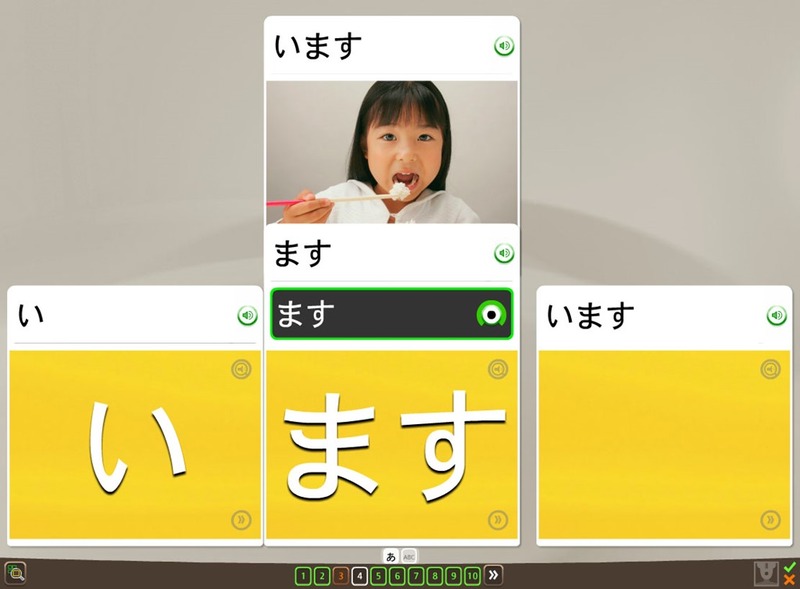 For Japanese lessons, you can choose whether to see the written word in kanji, hiragana and katakana or romaji (our roman alphabet). In the pronunciation lessons, you must speak the answer. 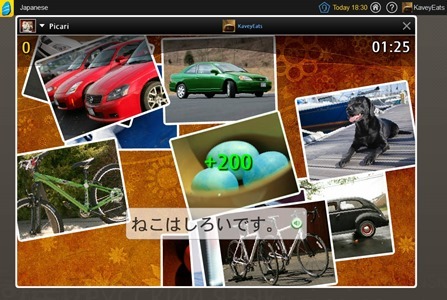 Rosetta Stone incorporates powerful voice recognition software, and I’ve had no trouble with this aspect at all. In the earliest lessons, you are required to pronounce each syllable of a word in turn before pronouncing the word; it’s just a matter of repeating what is said. 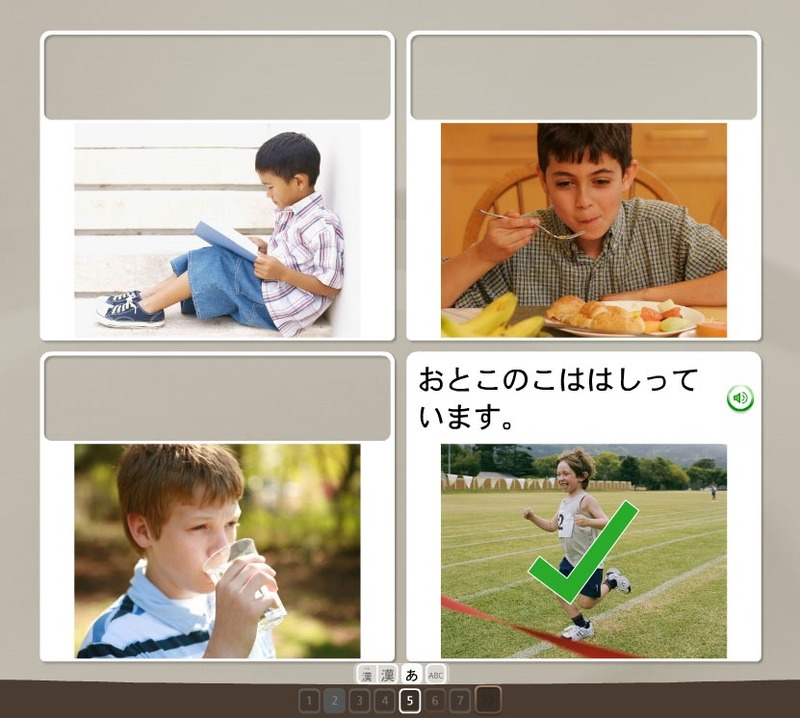 But before long, some example sentences are spoken, along with appropriate images, and then you are required to work out (and say) the sentence for the next image. Because the tool is designed to be immersive (and perhaps also so a single version can be sold to learners worldwide, with a native-language dashboard applied to the front end), there is absolutely no information within the lessons in your native language. Rosetta Stone is not a cheap option and many baulk at paying so much. One aspect of the new TotalE subscription that makes the price far more of a great deal is the inclusion of live group sessions lead by tutors who are native speakers of the language you are learning. Details seem to vary according to language but for Japanese, sessions are 25 minutes long and the maximum group size is 5 students. There are also a few learning games provided, many of which are best played with another learner. At the times I’ve been logged on and learning, I’ve never been able to find another learner at the same level also looking to play the games with me. Additionally, there are some stories provided for reading out loud. I’ve learned a pretty decent amount of vocabulary, and a few very simple sentences, and it definitely feels like it’s sticking. I don’t have to struggle to recall it at all. That said, thus far there’s very little of much use in that. I still can’t ask someone’s name or tell them mine, say where I’m from, ask for directions or how much something costs or request the menu or bill in a restaurant… I’m starting to wonder when we’ll move away from the kind of vocabulary that’s of interest to a small child and on to more useful content. I am not sure that the reading and writing is very well integrated, for Japanese learners. Firstly, I have found myself asked to identify a written phrase at a point when I’ve only learned a handful of hiragana characters. Secondly, I don’t see the point of including writing lessons based on a roman alphabet keyboard, for non romaji learners. Because of the lack of explanation or help in English, when I don’t understand the lesson or what I’m asked to do, there’s no way within the tool to find out what that lesson is trying to teach me. Sometimes I’m so completely and utterly stuck that I am forced to Google for answers, and hope someone else has asked the same question. Support material in my own language, even in a printed or PDF document provided alongside, would be very welcome now and again. Likewise, I would like a way to reference back what I’ve already covered, but reviewing previous lessons is impossible unless I want to actually take an entire lesson again all the way through. It’s possible to cheat, unintentionally. When learning numbers, I couldn’t understand the words for the numbers, but chose the right answers because I knew the word for the items in the images, such as 3 eggs, 1 ball, 2 cups, 4 chairs. If the images had all been the same item, I’d have been forced to focus on the actual numbers themselves. This was further complicated by the fact that Japanese has several different versions of each number, the choice dependent on the type of object being described. Rosetta Stone fell down in this area, and this was another instance when I had to look for information outside the tool to understand. The 3 group sessions I’ve been able to take with a tutor have been really great and really allowed me to see where my gaps are as well as see that I am making progress. The tutors are helpful and encouraging. The sessions follow the same material and use the same images as the core lessons. However, scheduling these sessions is proving very difficult indeed. Firstly, for Japanese learners, sessions are offered only for every 2 units rather than at every unit level like with some languages. Secondly, there are not very many slots available, especially that are suitable for learners in European time zones. Thirdly, whilst I’m happy with the restriction to only be able to book 2 sessions ahead at a time, the additional restriction that I can’t have 2 for the same unit booked at the same time doesn’t make sense. Rosetta Stone is happy for me to take as many sessions at any given level as I like, but not to let me have 2 scheduled as such. So by the time I can book another session, I usually find nothing available for a date and time I can manage. Spending a small amount of time every day has allowed me to progress fairly quickly. With the proviso that I’ve had to Google when I’ve been completely stuck a few times, I’ve found the majority of the lessons very easy and have found progress straightforward. Despite my frustrations above, I find the interface fairly easy to use and am delighted that it’s enabling me to learn Japanese! With thanks to Rosetta Stone for my online subscription. 6 Comments to "Getting To Grips with Rosetta Stone"
Very interesting and informative. Hope the frustrations lessen as you get further into it. Good idea, on watching subtitled shows, thanks, will do that! This is actually vital info for me. I have exactly 12 months to learn Cantonese (trip with the in-laws next summer). This is a really good, detailed write up (then again that’s nothing new for you :P) I might give Rosetta Stone a whirl. Hi Phil, oh my, good luck! I’d say you should start with Rosetta and let it get you into frame of mine, and get you talking and understanding basics, and then look for some supporting material to take it further. I’m going to look for a book or two to give me some more useful phrases as a supplement to Rosetta Stone, I think.